JOTSE select the articles to be published with a double bind, peer review system, following the practices of good scholarly journals. 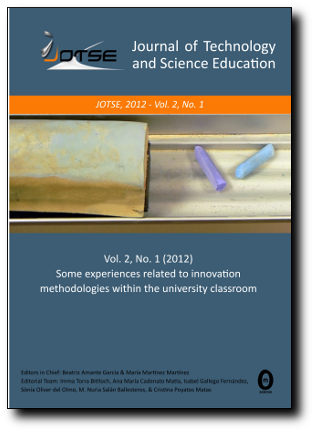 JOTSE is published semiannually exclusively on-line, and following an open access policy. On-line publication allows to reduce publishing costs, and to make more agile the process of reviewing and edition. Jotse defends that open access publishing fosters the advance of scientific knowledge, making it available to everyone. JOTSE publishes articles in English only, but JOTSE accepts papers in Spanish. When a paper written in Spanish is accepted we offer a translation service (ask about the price). These may be on any topic relevant to engineering education in higher education and may take the form of pedagogic research papers, case studies, critical reviews and evaluations; they may describe investigations of new methods and the results of action research; they may consider policy matters and the changing context of engineering education. The Editors-in-Chief will perform an initial appraisal of each submitted manuscript based on its fit with the focus and scope of the journal. If the submitted manuscript complies with these criteria, the Editors-in-Chief assigns it to one of the members of the Editorial Team (editors) who will perform a second appraisal of the manuscript based on the scientific merit and validity of the article and its methodology, the relevance of the article, the interest of the topic to the reader, and the presentation and understandability of the article itself. If the submitted manuscript is suitable to be sent to a peer review, the submitted manuscript is reviewed by two members of the Reviewer Board of the journal who don’t have potential conflicts of interests. If editors don’t find a specific reviewer for the submitted manuscript, they will search other specialist of the topic of equal repute and based on his/her expertise and standing in his/her field. The peer-review process is double blinded. The reviewers will return their recommendations and reports to the editor, providing general comments to the editor and both general and specific comments to the author(s). Constructive comments that might help the authors improve their work are passed on anonymously (even if editor do not accept the submitted manuscript). After that, editor assesses them collectively, and then makes a decision, either on his or her own or in consultation with other editors on whether to reject the manuscript. The final decision on acceptability for publication lies with the Editors-in-Chief. The editor will communicate the overall result of the evaluation (rejected, accepted or accepted with modifications), including the reviewer's comments. Revised manuscripts may be subject to further peer review if appropriate. JOTSE is published twice a year (March and September). The two issues of one year are the two numbers of one volumen. Occasionally, JOTSE can publish special issues about specific research themes. These special issues can have specific editors. For these special issues, specific calls for papers will be announced. Unlike other journal, whose business model is based in making readers pay and therefore their contents are closed to the public, JOTSE is published on an open access basis, which allows authors reach a wider audience and foster the international and social impact of their contributions. To make this open access policy sustainable, JOTSE charges fees for article layout setting and publication in open access. The submission process of the original and its double blind review have no cost to the authors or institutions that fund the research. From January 18th, 2019 publication rate for accepted papers is 295 €/article. Papers received before this date maintain the price of the previous period. To make the payment, once the article is accepted, OmniaScience will contact with the authors. Following author's request, the payment can be split between different authors or institutions that fund the research. The publication of an article in a peer-reviewed journal is a very crucial task in disseminating knowledge and contributes for the scientific development. As a peer-reviewed journal, the rigor of scientific publication is expected to be observed in the course of evaluating papers that are submitted. Therefore, ethical behavior is expected for all parties involved during the publishing process: the author, the journal editor, the peer reviewer and the publisher. Click here to read the duties for authors, editors and reviewers according to the Omnia Publisher Publication Ethics statement. Authors or contributors are required to properly cite and quote sources of literature that they used in their research articles. Plagiarism may be manifested in variety of ways such as using another’s paper as the author’s own paper, intentional or unintentional copying or paraphrasing parts of another’s paper without citation, claiming results from research conducted by others. In order to minimize the reception and mainly the publication of plagiarized papers, JOTSE is going to check the papers received from December 2017. Crossref Similarity Check is a service that helps editors to verify the originality of academic papers and manuscripts. CrossCheck is powered by the Ithenticate software from iParadigms, known in the academic community as providers of Turnitin. The content of JOTSE is added to the Crossref anti-plagiarism database, allowing other publishers to detect plagiarism in papers and manuscripts through iThenticate software. OmniaScience is committed to provide a quality service, and to work in an open and accountable way that builds the trust and respect of all our stakeholders. One of the ways in which we can continue to improve our service is by responding positively to complaints, and by putting mistakes right. Click here to read the full text of our complaint policy or claiming.